Tot Tutors Activity Table & 2 Chairs Just $29.99! Down From $50! PLUS FREE Shipping! You are here: Home / Instagram / Tot Tutors Activity Table & 2 Chairs Just $29.99! Down From $50! PLUS FREE Shipping! Your kids need this! Head over to Toys R Us and get Tot Tutors Activity Table & 2 Chairs for just $29.99 down from $49.99 PLUS FREE shipping! 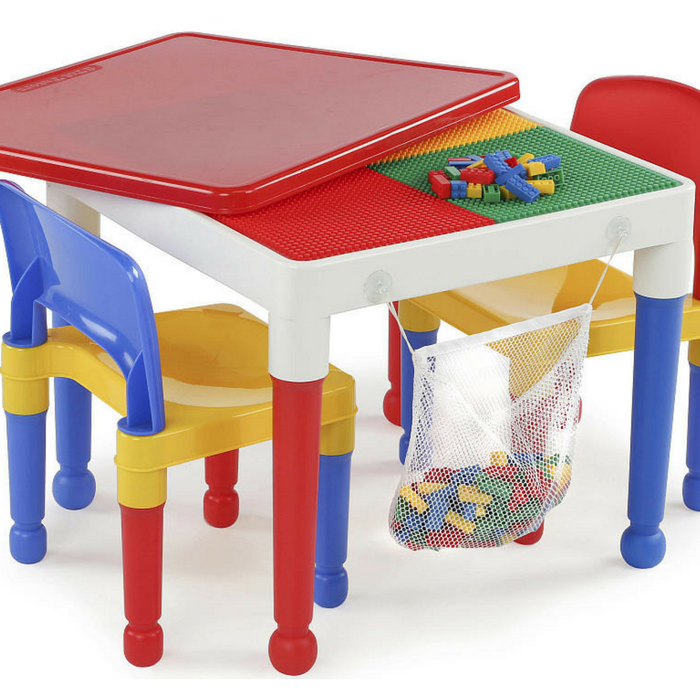 The Tot Tutors 2-in-1 Plastic LEGO Compatible Activity Table and 2 Chairs Set features a play surface compatible with most building blocks. The 20 inch x 20 inch table comes with 2 chairs, a removable table cover, and a mesh storage bag filled with a 100 piece compatible block set. It is ideal for your child’s bedroom, playroom or the living room. The smooth tabletop is removable to reveal a construction table for use with building blocks. With the cover on the table, it’s great for kids to eat, read books, color, do arts and crafts, play board games and just have fun.